A new cookbook by Thomas Keller, owner and chef of Bouchon in NYC and the French Laundry in Napa Valley called Ad Hoc at home - has recipes that are a bit more approachable than those in his previous books. 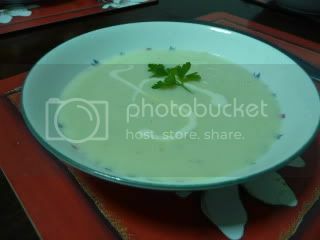 He uses a Vitamix blender to puree the soup, but the TMX really simplifies making this wonderful soup. Keller's version is served with a drizzle of olive oil, home made croutons and deep fried beet chips. Put about 500 mls of water in TMX bowl. Place cut up cauliflower, white of leek and onion in steamer basket. Steam on varoma temperature for about 30 minutes. Add the steamed vegetables to the remaining steaming water, add the milk, cream, salt, pepper and curry powder. Simmer together for about 30 minutes at 90 or 100º C speed 2. Allow to cool for a bit, then blitz at speed 7 with the measuring cup in place, taking care not to burn yourself. cookie1 - This is tasty and ever so creamy. I only used milk, no cream. It was easy to make and used up the cauliflower that was looking a little sad. A great soup for our cooler evenings. Chocdoc - I made this again a couple of days ago. Didn't have any leeks so I used garlic scapes in it's place. Didn't have 'proper' curry powder, so used a little garam masala and cumin that was here. Interesting difference in flavour - almost mushroomy. This looks very easy to make. Roll on winter. I'm not too fond of summer. I;m sure you could have it cold cookie1. It is similar to a Ducasse recipe that I converted - great minds think alike ( I mean Keller and Ducasse - I'm not great). Mr Keller owns 5 thermomixes I understand! At least - he may have bought more after using them. I made this last night and it is tasty and ever so creamy. I only used milk, no cream. It was easy to make and used up the cauliflower that was looking a little sad. A great soup for our cooler evenings. I'll post a photo later as I forgot to take one last night and will do so tonight when we have the rest of it. Thanks cookie1 - I just bought some cauli last night & love soup. I made this again a couple of days ago. Didn't have any leeks so I used garlic scapes in it's place. Didn't have 'proper' curry powder, so used a little garam masala and cumin that was here. Interesting difference in flavour - almost mushroomy. Mr. Keller uses and endorses Vita-Preps and I suspect they and his TM31s complement each other in a professional kitchen. I've had a Vita-Mix (now Vitamix) since 1988 and once I get my Thermomix, it won't be going anywhere. I love clever, well-made appliances and I enjoy putting them through their paces--gets the creative juices going! Its been freezing and wet here today, so I decided to make some soup for afternoon tea. I used cauliflower and broccoli as I didn't have enough of either by itself. It was just what we needed. I used all milk too. Thanks for bumping the recipe Cookie.